Vote for me to become a wine apprentice! I have the chance to learn about making wine first-hand at Oberon Wines in Napa Valley. But I need your help to get there. I entered a video contest to win a free weeklong trip to Napa Valley that includes travel, lodging, meeting Tony Coltrin, the winemaker at Oberon, and being his apprentice for the day. My video made it to the finals! 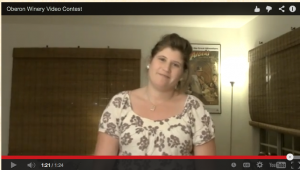 See, that’s me, smiling in my contest video! Now that I’m in the top 8, I need people to vote for me to get to that final step. Whoever gets the most votes, wins!